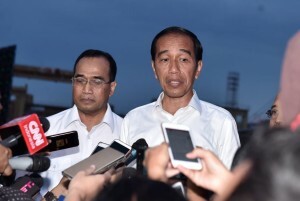 President Joko “Jokowi” Widodo has sent his deepest condolences to the victims of flash floods that hit Sentani, eastern Papua Province on Saturday (16/3). “My deepest condolences to the victims and families affected by the disaster,” President Jokowi said after attending the Traffic Safety Declaration and Dissemination at the Jakarta International Container Terminal (JICT) in Tanjung Priok, Jakarta, Sunday (17/3). The President added that he has instructed Head of the National Disaster Management Agency (BNPB) Doni Monardo to visit the affected areas and to lead the evacuation process. “The most important thing is to evacuate the people immediately,” he said.